Click to viewSometimes temptation can be all-consuming, especially when you're still chasing a repeat of your first high. That's why, Hollywood, we're staging this sequel intervention - because sometimes, it's like you're on crack. 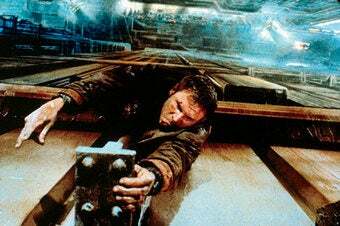 We heard the perverse rumors about a Blade Runner 2. They mercifully proved to be moot, yet we were admittedly quick to believe them. Why? Because time and time again, you've let us down by creating crappy, money-grubbing updates to lucrative properties. It's time to face reality: With the exception of, say, The Empire Strikes Back and Spider-Man 2, the majority of sci-fi-ish sequels won't match their predecessors in quality. So we've provided you with this 12-step list of movies that need no continuation, to get you started in your quest for a new, righteous life. Seriously, back off. Metropolis (1927) With the economy imploding, we know what The Suits are thinking: Why not tap into the zeitgeist by remaking this stylish, silent, futuristic thriller about socioeconomic-class chasms? Added bonus: At the heart of the film is a hot stripper robot - total box office bullion! To paraphrase Nigel Tufnel, speaking about his precious vintage guitar in Spinal Tap: "Don't touch it… don't point, even." No, don't even look at it. Close Encounters of the Third Kind (1977) After the success of his UFO-sighting film, Stephen Spielberg expressed interest in revisiting the property, which haunted our minds and stoked our imaginations as we pondering these mysterious aliens. Soon after, he made the cuddly E.T. instead. Smart man. 12 Monkeys (1995) A dude goes back in time and hangs at a mental hospital while trying to stop an earth-plaguing virus, in this gripping, plot-twisting head trip. Anything more would simply be anti-climactic. Besides, what would you call it: 13 Monkeys? 24 Monkeys? The Running Man (1987) We know what you're thinking. The awesome, sensational Running Man - about a to-the-death reality show for felons - would make a perfect obvious tie-in soon enough. It takes place in 2019! Which is coming up. Like, relatively soon. Too bad Death Race beat you to the punch. As we learned, the game show-as-moral-decay metaphor simply isn't shocking anymore. Besides, we've been getting our fix of dystopian competitions from Japanese competition shows anyhow. Akira (1988) A thriller about a covert government op and a guy teeming with supernatural powers, this is an apocalyptic epic of sweeping beauty and challenging complexity. To attempt to improve upon - or even mimic - this classic would be utter hubris. Armageddon (1998) Despite popular disdain, the hysterically ridiculous doomsday asteroid flick made a killing, internationally, at the B.O. And we know you all too well, Michael Bay. We'd hoped you'd learned your quality-control lesson from Bad Boys II, but here's hoping you will with Transformers 2. Donnie Darko (2001) Director Richard Kelly's break-out movie was dark, intriguingly time-twisty, and made ghoulish use of a rabbit. It also went on to become a surprise cult hit, which is why the industry is so ready to juice it with a story about the creepy misadventures of his little sister (Sparkle Motion!) while on a roadtrip. (Nightstalker director Chris Fisher will helm the follow-up.) S. Darko, as it's called, was said to have started shooting in May. But, as we learned from the original, it's never too late to change fate and put this risky proposition out of its misery. Ghost Rider (2007) Nicolas Cage's painful paean to the flame-headed motorcycle enthusiast made a decent chunk of change, so a follow-up is already in development. But it's never too late to do the right thing and snuff it out of its misery. According to the actor, there's been talk about "going international with that character. Taking him into Europe, having him go on a motorcycle." Perhaps we should use that Penance Stare on the sinful filmmakers-apparently the fate of the Western world depends on it. I Am Legend (2007) The lucrative, Will Smith-starring adaptation of the Richard Matheson book initially found its stride, then missed the plot mark completely - that the infected vampire/zombies are, in fact, evolved humans - in its frustrating, off-putting second half. Still, not ones to pussyfoot around, Warner Bros., eager to cultivate another franchise, has obtained the sequel rights. But forgive us if we doubt Hollywood's commitment to the fine source material, given the tendency to transform anything cerebral into a mindless popcorn flick. Watchmen (2009) Zach Synder recently took the high road and declared that he's doubtful he'd direct a second Watchmen without the Hollywood-loathing Alan Moore's involvement - which pretty much settles that. Or not. Once we figure out who owns the big-screen rights to the property, they can theoretically bastardize the bejesus out of it. Surely some things are sacred.